For twenty years I worked in an office. When not in an office I worked while commuting from courtroom to meeting room to boardroom to airport to hotel . . .you get the picture. Then I stopped working in an office and opened a retail bakery. Then I switched to a home office, which is where I spend most of my days now. It's important to have a "work space". I call mine my "home office". When I first started working from home I used what was available. I used the couch, the dining room table, the kitchen table and the desk in my bedroom. At the time, I was personally in transition and thus, my "office" was in transition. I didn't own the "working from home". Rather, I owned a shop and worked at home some days, or I practiced law but was just working from home temporarily until I could find an office, etc. For a long time I was unproductive because I felt "less than". Did I even have a real job if I worked from home? My husband and I created a running joke: once he asked me what I was doing and I responded "Bonbons and Netflix". That became code for "working from home" and that was the perception---that people working from home weren't really "working". AND THEN, I BURNED THE BOAT. I realized that working for myself was the only way I was going to be happy. I committed to a future---to working from home and my home office, or anywhere in the world I wanted to work. I went all in. When I did that, I "officially" set up an office. I claimed the unused den as mine, I cleaned it out, I set up my works space and it became my official office. Let me tell you, the effect that shift in mindset had on me was astronomical. Now I don't care if the perception is "Bonbons and Netflix" because I LOVE where I work and what I am doing. I have an official space. I own my day. Keep reading and find out more. When you work a job where you have to go to an office or a shop or a factory or a place: you have a schedule. A schedule sets you up for success. It's no different when you work from home. Everyday I get up at the same time when my alarm goes off. When I first started working from home, I didn't keep a schedule because I just worked until I got my work done. Often I was working at 2 am and I would sleep until 7 am. Looking back on it I realized that I was not set up for success. While that may not be wrong for some people, I have a family and I realized that my work schedule needed to mimic the parts of my old schedule that worked for us. Plus, I was happier and healthier with my old office schedule. I clearly wasn't getting enough sleep, and even if I went back to sleep after the kids left for the day, I wan't effectively using my alone hours. So I changed my pattern. I set up a schedule whereby I go to sleep at 11 pm and wake up at 6 am. At first, it was really difficult because I am a night owl. Now I love my schedule because I am highly productive: I get into my home office at 8 am and I leave it somewhere between 3 and 5 pm. There are days that I do errands, go to the gym, meet clients, go to the shop, go to a meeting, take the kids to appointments, etc. But my "office" hours are more structured and I'm not working in the middle of the night. I may still do emails from the couch from time to time or take calls on the patio---but having a "work" schedule equates to productivity for me. To increase your productivity if you work from home, you need to eliminate distractions. I just follow a practice I had in an office setting that worked for me. I NEVER turn the TV on during the day. I have set times I look at social media. I schedule calls between 8 and 3 when nobody else is home. When I first started working from home, Social Media was my biggest time killer. We've all been there---you start scrolling through your feed and bam! It's suddenly two hours later and you've gotten nothing done. When I recognized that time zapper I set a New Year's goal to reduce my social media usage and keep a schedule for it. That has created a huge shift in my productivity. Because I work from home I have to keep my cell phone nearby so it does take willpower to not check my social media accounts. However, I allow myself to make a post for marketing reasons during the day or to do some research---no social scrolling. I'm a happier person since the change! In a structured work setting you often have a lunch ---whether that's a sack lunch or eating out. When you work from home you don't officially have "lunch", unless you're meeting clients or friends for a luncheon. For some people, like me, that meant I could eat whatever, whenever. So I would sit and do a little work, get up and stroll to the kitchen and eat a little. . .do some more work, get up again and get some more food. . .and so it went. It's a time killer and while smaller more frequent meals can be a good thing, I was just snacking a lot. So I got rid of constant snacking by eating more balanced meals. I eat breakfast before going into my office and take a break to fix lunch. I also keep a box of multigrain crackers on my desk and some granola bars in my drawers to prevent using "getting a snack" as distraction. We work from home for a variety of reasons and one of them is freedom. This means if you want to paint your family room on a Tuesday in the middle of the day, then by all means do it. If you want to do the laundry then run to the grocery store---do that too. That being said, you still "work". Sometimes our tasks of daily living can cloud over the fact that we still have a job even if we're home. My family takes advantage of the fact that I work from home. "Mom, I forgot my P.E. clothes, can you bring them to school?" "Honey, I scheduled the HVAC guy to come at 1 pm on Wednesday." "Can you take the dogs to the vet at 10?" IT DRIVES ME CRAZY SOMETIMES. I don't know what they would do without me, and I am blessed and thankful to be here for us. However, all these family errands and things around the house are sometimes a time killer. It's like they think it's all "Netflix and Bonbons" and not something professional going down here. I realized that I need to set daily goals to keep on track. That helps me know how to balance out the errands and chores. If I have an errand in the middle of the day but I haven't yet finished my goals, I know I may have to work after dinner. I put together my list, balance it with my professional appointments and personal errands and stay on track for the day. It's not any different than when I worked in an office. If there's a day I don't have a big list, then running all the little errands or doing chores is a piece of cake. If my list is huge, I set limits by saying "sorry, I can't do that today because I'm busy." Nearly everything can be rescheduled (except the urgent runs to school). I hope these tips have helped you. 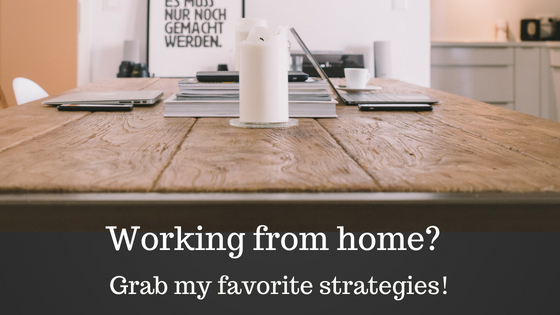 If you work from home, let me know your own tips!